One of the best old time cocktails is the Gin Rickey. 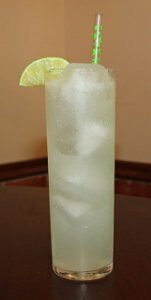 This simple highball includes: gin, lime juice and club soda, so it is very refreshing on a hot summer day and it is a fantastic change from the all to often Gin & Tonic which i seem to still be sipping on from the last post i did. I love Gin. This cocktail was originally conceived in Washington D.C‘s popular congressmen hang out, Shoemaker’s. The recipe for the gin rickey was dedicated to and named after “Joe” Rickey who was a old time lobbyist who died 1903. He was one of the popular guys in political circles of the day and regularly entertained the elected officials as part of his job. Joe was so well loved that the bartender at Shoemaker’s named this cocktail after Mr. Rickey passed on. Over the years, it was a nice little bit of gratitude from a bartender after years of patronage by a faithful and friendly customer. So what goes in a Gin Rickey? My guess is if Old Joe were more of a martini drinker, he probably would have sipped this juniper flavoured tall drink out of a classier glass.